If your grandfather clock is running slow or fast, it is easy to adjust and regulate it. Changing the speed of time keeping is accomplished by moving the pendulum disk up or down. 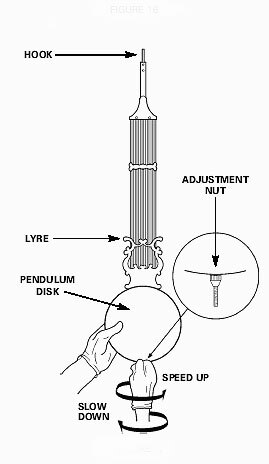 The pendulum disk is moved up or down by turning the adjustment nut. To slow the Grandfather Clock down, move the pendulum disk down by turning the adjustment nut to the left. To speed the Grandfather Clock up, move the pendulum disk up by turning the adjustment nut to the right. 1. Select a time of day that will allow you to check your Grandfather Clock at the same time for at least six days. 4. Re-set the minute hand to the exact, correct time. *** IMPORTANT: You do need to set your clock with another that indicates seconds or if you are using a smartphone or VCR, set your clock when the time advances one minute to the next. Failure to do so may give you poor results as you will not know what portion of a minute has passed to when setting your clock. 2. Compare time shown on your Grandfather Clock with the correct time. Is your Grandfather Clock fast or slow? revolution for each half minute fast or slow per day. (24 hours). 5. Re-set the minute hand to exact, correct time. When you turn the nut down, you are lengthening the Grandfather Clock pendulum making the clock run slower. When you turn the nut up, you are shortening the Grandfather Clock pendulum making the swing faster which will increase the speed of your clock. Never turn the nut more than one revolution per day or you may overcompensate. Each time you make an adjustment, you should turn it less than the previous day. If you have lowered the nut as far down as it appears and your clock is still fast, you should check to make sure the nut is properly fitting the slot on the bottom. Adjusting and Setting up your Pendulum on your grandfather clock. I’m having problems regulating the number of chimes my clock strikes with the time on clock, it’s one strike behind. 1) When the clock comes up to the next hour, count the hour strike from the chimes. 2) Move the hour hand (the short hand) to the number of the hour you had just counted. 3) Move the minute hand to whatever the correct time is where you are at that time. Done! Sometimes it does take about an hour for the chimes to sync correctly, but this is how it is done. It is probably the pendulum length, though it could be a problem in the movement. Take out the pendulum and place it back up on a flat surface. Examine the nut and the threaded rod to make sure it is all the way up. If you are truly at the end of the threads, make sure the bob (the round disk) is able to move up and down with the nut. If it is, you could place some type of a spacer (like another larger nut of any kind) slightly larger that can move freely up and down the rod, then place the original nut under that one which will raise the bob to a higher level. If this is original pendulum and the nut was at the top of the threads, I would really suggest finding a clock tech in your area, as it is probably something else. My grandfather made my grandfather clock and the pendulum disc does not move. It does have an adjustment screw on the bottom. It’s running about 15 minutes slow in 24 hours. Is there anything I can do for this. My grandfather has passed away so I can’t ask him about. Looking for some advice. I would love to get the time running correctly. 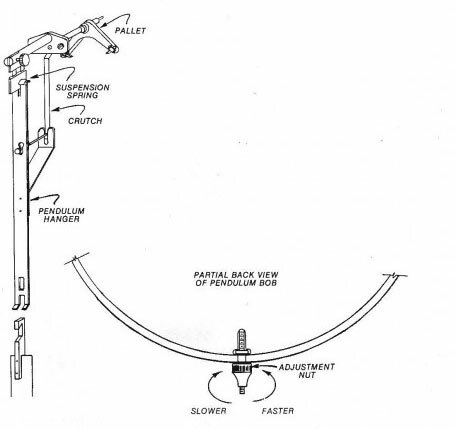 The nut at the bottom should raise or lower the round disk (the pendulum bob). It might be stuck, stripped or maybe someone glued it in place. You need to take out the pendulum and place it on a table. Find out where it is stuck and release it. The nut needs to go up at least 7 turns if the tread is like most other clocks. This should correct it for you. Hi, We are having problems regulating the chimes. If it’s 7 the chimes ring 8 times. Please advise me on how to fix this. Thank you. Trying to ancipate what you might advise, I removed the pendulum, laid it flat on a table and poked it while making quiet threats about flea markets. Somehow or other this seems to have done the job: it’s now running correctly, or even a little slow (but that’s easy to correct). So thank you – even before you replied you’ve inspired me to find the correct solution. The pendulum “bob” must not be coming down with the nut. We have added some additional content that may help you. I just inherited a beautiful Howard Miller grandfather floor model clock, Can you tell me where I can get some information on operating procedures? You may download generic instructions for your grandfather clock at the following link. You may click the link to view. This should be very similar to what was packaged originally with the grandfather clock you now own. The thread varies with the clock design. Typically, the shorter the pendulum, the finer the thread. There is no correct spec for this. It makes it easier for the owner to set by widening the thread as the pendulum lengthens. Pitch?.. the threaded rod should be vertical. My grandfather clock no longer chimes every quarter, how do I adjust? This would be difficult to tell unless we were able to look inside the grandfather clock movement. This usually happens on older clocks (over 20 years old) that have not be cleaned and oiled every 5 – 7 years. The chime side is probably dirty and not allowing the parts to turn within the movement. Cleaning and oiling should be done by a technician. There is no user fix for this one. I have a Howard Miller 611-200 grandfather clock.. of the 3 weights one has a nut on the bottom the other 2 look similar.What are the correct weights (L,M R) for my clock and can incorrect weights be the cause of my clock running fast even after the pendulum nut (and disc) are set at the lowest position? If the clock is a 611-200, the weights should be marked on the bottom as Left, Center and Right. If not, the heaviest weight should be placed on the right (facing the clock). If the clock is running fast, it is most likely the pendulum and not the weights. Be sure to look at the lower diagram of the following page. Chances are the the nut is going down, but the “bob” (the round disk) is not following the nut when lowered. It might also be the bob is sitting on top of the nut. If this is a used clock, it may also be that someone replaced the pendulum with one of an incorrect length. I cannot get my howard miller grandfather clock to keep accurate time. Been trying for over a year. I have been told that on mechanical clocks if you can get them between 1 or 2 minutes fast or slow a week that’s good. Do you agree or should it keep accurate time? 1) Set the clock exactly to the correct time to the second. 2) Check it again EXACTLY 24 hours later and record the discrepancy. 3) If you are within a minute, make no more than a 1/4 of a turn on the nut in the direction you need and reset the time. 4) Check it again EXACTLY 24 hours later and record the discrepancy. 5) If it is closer, turn the pendulum nut less than before in the same direction as before. Repeat until you are pleased. This should make a dramatic improvement in the accuracy of your clock. Let me know how it works out. I have a cable driven howard miller grandfather clock and every time I wind it the clock looses about 20 to 25 seconds. It catches back up by the next day. Is this standard procedure for these type of clocks? I just acquired a Colonial of Zeeland Grandfather clock. It chimes 2 minutes faster than the dial. Keeping accurate time. Any ideas? Never mind. I found the answer, if anyone needs it, below. Watch the video. EXCELLENT!!! This will correct your clock. My clock keeps time but the quarter hour chimes are sluggish sounding. The clock should be oiled or cleaned and oiled every 5 – 7 years. The old oils become more like glue than oil when they decompose and get dirty. Sounds like your chime hammers are trying to move through the sludge of the old oils. I would suggest getting a good cleaning and oiling and I bet it would be fine. Hello, I have a grandfather clock from about 1910. It has the kind of mechanism that requires the clock to be leveled to run properly. The way it keeps time changes constantly. I get it properly adjusted and it keeps great time for a few weeks, then it either slows down or speeds up and I have to adjust it again. What would make this happen? Temperature? the moon? You can replace it with an all metal pendulum, but it is considerably less costly to correct the time once a week when you wind it. You would also want to keep your wooden pendulum as a metal pendulum would also take away from it’s antique value. We have inherited a Mason & Sullivan that was handcrafted by my wife’s grandfather in 1965. Having a very hard time leveling, and time is constantly fast. Nut and pendulum are all the way to last thread. Bob moves freely down. Any thoughts? We also have inherited many other wall and mantle clocks as well as 2 Atmos clocks which are amazing! If this is not the case, I would check to make sure the pendulum is hung correctly. The Bob is moving freely and is traveling with the nut and the pendulum seems to be hung correctly. What else could it be? Hi Robert, the clock does have wooden pendulum stick, and that does make sense. I suspected the temperature or weather but couldn’t really figure out WHY that would effect it (I didn’t REALLY think it was the moon). I will not replace anything, I really don’t mind fiddling with the clock, I rather enjoy it. It is a constant challenge to keep it as accurate as possible! Make sure the bob is moving up or down with the nut as it is rotated. Look at the illustration and make sure the nut is positioned on the back of the bob properly. This should work for you. I have a wall clock that kept very good time for twenty five years with the half and full hour chimes accurate to the time. The clock had not been wound up while we were away and when restarted after setting both hands to the appropriate time we noticed that the chimes were always five minutes late. We have tried resetting several times without success. Is there an adjustment screw on the meconisium that will correct this? There is an adjustment on the back of the minute hand that will let you set the hand so it will be pointing straight up on the hour. You might think of it as “the clock is right, but the hand is wrong”. Following the instructions will place the hand back on where it should be and correct your issue. Good Luck…Robert. I just found an Ethan Allen grandfather clock model 3027 movement GJ built 1983. I have lowered bob as far as possible and it is still running fast. The nut fits inside the bob ensuring the bob follows the nut. I know it was transported without the pendulum nor weights being secured. I checked the attachment and it looks appropriate. Any ideas or to I head to a clock shop. Thanks for sharing your expertise. Robert- Thanks very much for the information. I inspected and disassembled the hanger. Everything looked appropriate and fully seated. The clock still runs fast so I am going to attempt to fabricate a hanger extension to artificially make the pendulum longer. If it works I’ll let you know how I did it! Thanks for sharing your expertise with all of us. we inherited a grandfather clock that we moved to our home. I’ve gotten it to stay running but it picks up time after a couple days. What can I do to correct?. There is an adjustment that lowers the pendulum. Do you think that will do the trick? Moving the nut on the pendulum will adjust the speed of your grandfather clock. Thank you for this excellent site about GF clocks! With my GF, the pendulum stick is wood and the bob is snug on the shaft and needs to me gently ‘pushed’ up or down to get it to move – just turning the regulator nut is not enough. I loosen the nut a little and then carefully move the bob while supporting the shaft to avoid damaging the suspension spring. With the bob in its new position, I retighten the nut a little bit and the bob stays in the new position. I have the clock on a carpet floor with the clock setting on a solid marble base. To prevent the case from swaying, I’ve placed 3 wooden balls (approx 1 inch diameter) under the marble to form a solid tripod between the carpet and the marble – that makes the contact patch very small and prevents the marble from ‘floating’ on the carpet. Using the marble base and 3 balls works better than with the 4 feet of the clock directly on the carpet (smaller contact area). My grandfather clock chimes the hour on the half hour. How do I get it to chime on the hour? Can I use a light lubricant such as wd40 to oil the clock as the oil I have is very old and looks a bit to thick? Hi Robert. Thanks for that I suspected that it might cause problems.